Brakes are one of the most important safety features on your vehicle, so it’s crucial that you keep them well maintained and stay on top of any repairs. At The Car Works!, we have expert technicians who specialize in brake system repairs. Our service center, located in Warren, RI, is fully equipped with the best diagnostic and maintenance tools. Below are a list of services and repairs that we provide for brakes. So whether you’re having an issue with your brakes or just want to keep up with their maintenance, bring your car to The Car Works!. We guarantee the highest quality service at the best possible price! Drum brake systems are typically used to help stop the rear wheels of low performance vehicles and large trucks. Located on the rear axle, they use hydraulic pressure to generate friction and slow the vehicle down. The main components of a drum brake are the wheel cylinder, the brake shoes, the return springs, and the brake drum. The wheel cylinder sits at the top of the drum brake with two pistons inside. When the brakes are applied, the pressurized brake fluid pushes the pistons outward, which in turn force the brake shoes against the outer drum. The result is enough friction to stop a 2 ton vehicle. At The Car Works! we recommend that you come in as soon as you notice any signs of malfunctioning brakes. Brake failure is not worth the risk of not bringing it in. Below are a list of common brake problems and their symptoms. If you’re experiencing any of them, bring your car by our repair center, located in Warren, RI. One of our expert technicians will be standing by to help! 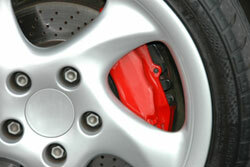 Disc brakes are the most common brake systems used in vehicles today. Typically located on the front wheels, they are comprised of brake pads, a brake caliper, and a brake rotor. They function in the same way as brakes on a bike--with brake pads on either side of the wheel that tighten when pressure is applied. The resulting friction slows the wheel down and then brings it to a complete stop. In the same way, disc brake pads straddle the rotor so that when the driver applies the brakes, pressurized fluid is released causing the brake caliper to squeeze the pads together and slow the vehicle down. At The Car Works! we recommend that you come in as soon as you notice any signs of malfunctioning brakes. Brake failure is not worth the risk of not bringing it in. Below are a list of common brake problems and their symptoms. If you’re experiencing any of them, bring your car by our repair center, located in Warren, RI. One of our expert technicians will be standing by to help! There are several things that can go wrong in this kind of brake system. Disc brakes function by transforming the energy from the engine (in the form of hydraulic pressure) into friction, generating an enormous amount of heat in the process. Consequently, if the brakes are quickly cooled when they’re hot—maybe you drove through a puddle—the rotor can become warped. When this happens, you will begin to feel the steering wheel shake when the brakes are applied. To fix this problem, one of The Car Works!’s expert technicians will either replace or resurface your rotor, depending on the degree to which it’s warped. The disc brake system is constructed around the rotor, which is a metal or ceramic disc that attaches to the axle and rotates with the wheels. When the brake is applied, hydraulic pressure tightens the two brake pads straddling the rotor. This creates enough friction to slow or stop the spinning disc and subsequently the wheel. During this process, an enormous amount of heat is generated. If a hot rotor is cooled too rapidly—such as when a car goes through a puddle—it can become warped. This will cause the brake pedal to shudder or pulse when pressed. To fix this problem, one of The Car Works!’s expert technicians will either replace or resurface your rotor, depending on the degree to which it’s warped. In addition, if you start to hear squealing when the brakes are applied, your rotor might be worn and should be replaced or resurfaced. If you notice any vibration or squealing when braking, bring your car in! The Car Works!’s service and repair center is located in Warren, RI. Another common problem that occurs with brake calipers is an air leak. Because the disc brake system relies on hydraulic pressure to create friction, it must be airtight. When air is introduced into the brake fluid it is easier to compress making it harder for the caliper to apply pressure to the brake pads. This problem usually results in a spongy or soft feeling brake pedal. If you experience this, bring you car to The Car Works!. Our expert technicians will perform an air bleed to extract the air from the brake system, which requires opening the caliper’s wheel cylinder and releasing the air within. The Car Works! is Warren, RI’s most trusted provider for brake services and repair. So come by today, we’re ready to get you stopping smoothly! Most disc brake systems contain two brake pads that are designed to create friction and straddle the rotor. Each pad has a friction lining that contains semi-metallic compounds and ceramics to create the maximum amount of resistance with the rotor. When the brakes are applied, the caliper uses hydraulic pressure to clench the brake pads together, effectively stopping the rotor and the wheels from spinning. You should have your brakes and your brake pads inspected annually—they are a normal wear item on any car. If your car exhibits squealing brakes, grinding brakes, a pulsating brake pedal, a soft brake pedal, or dragging bring your car in immediately. Brakes are one of the most important safety features on your car, so you want to make sure that they are performing at their best. At The Car Works! we pride ourselves on superior brake service, so if you’re having any issues come by or make an appointment. Our service and repair center is located in Warren, RI. Anti-lock Brake Systems are widely used in vehicles today to prevent skidding during emergency brake maneuvers. In a car without ABS, if the brakes are applied and a wheel stops spinning while the vehicle is still in motion, the driver will no longer have control over that wheel. That loss of control could lead to skidding and the inability of the driver to steer properly. A car with ABS, however, will be able to control all four wheels even if they’ve stopped moving. This is because each wheel has a speed sensor attached that relays information to a central ABS computer. If a wheel does stop spinning, the ABS computer will pump hydraulic pressure to that wheel, essentially releasing and then reapplying the brakes. The main issue that arises with Anti-Lock Brakes is faulty sensors. If the speed sensors are not working, the ABS computer won’t know when or to which wheel it needs to pump brake fluid pressure. At The Car Works!, we recommend that you have your sensors tested when you’re having any other brake maintenance or repairs performed. If your ABS light comes on, bring your car in as soon as possible. Our service and repair center is located in Warren, RI. Our technicians are ready to put their expertise and years of experience to work on your brakes! Whether your car has a disc or a drum brake system, it contains a brake master cylinder. Located in the driver’s side firewall, the master cylinder is responsible for converting the pressure of the driver’s foot hitting the pedal into hydraulic pressure. It does this by using two pistons to compress brake fluid. A rod connects the brake pedal and these pistons so that when the driver’s foot presses the pedal it’s also pushing the pistons. Subsequently, the brake fluid is pressurized and applied to each wheel. The major problems that arise with the master cylinder stem from leaks. A leaking brake line within the system will make it impossible for the master cylinder to pressurize the brake fluid. When this occurs, the brake pedal will go all the way to the floor when pushed because there is not enough fluid to compress. Master cylinder pistons can also leak if their seals become worn. In either case, you should bring your car in immediately. At The Car Works!, we have experienced technicians who can handle any problem you’re experiencing with your master cylinder. Our fully equipped service and repair center is located in Warren, RI. At The Car Works! we guarantee superior service at the best possible price!